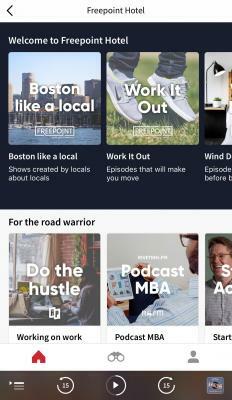 Curated podcasts are delivered via an app for the Freepoint Hotel. CAMBRIDGE, MA—Listen up. Podcasts have been around for years, but as travelers increasingly desire local experiences and a technology-enabled hotel stay, these digital radio programs are beginning to gain traction as a key differentiator in the hospitality space. Freepoint Hotel, a new boutique hotel here, has teamed up with RadioPublic to offer what the partnership believes will be a standout guest amenity: curated podcast playlists. “We haven’t seen many hotels explore creative ways to integrate podcasts into the guest experience, so we saw a partnership with RadioPublic as a way to really make some noise within the sonic space,” said David McCaslin, EVP of HHM, the hotel’s management company. To get the effort off the ground, the hotel team first spent hours exploring Cambridge and Boston as a whole to source a number of unique and authentic partners and products that had synergy with the Freepoint brand. “We wanted Freepoint to embody that intellectual and innovative spirit that has become synonymous with the Cambridge community, so we did a lot of exploring within technology, especially at a local level. Considering that podcasts continue to be such a force within media and public consumption, we saw opportunity for a hotel to deliver to this demand in a fun and thought-provoking way,” said McCaslin. Podcasting is a medium with staying power. According to a study by Edison Research and Triton Digital, 40% of Americans age 12 years and older have listened to a podcast; the weekly online radio audience is now at 140 million Americans, or 53% of Americans; and time spent listening to online radio has surged to an all-time high of 14:39 minutes per week. The team also made sure to add a local angle in the other playlists and curate programs designed to accompany a guest on a trip to the fitness center or out for a run. There is also a “Winding Down” playlist, consisting of episodes to listening to before bed, including an episode from the Berklee College of Music podcast. Freepoint’s Chef Matthew Gaudet also created a playlist of food and beverage-centric episodes that highlight some of the local food scene. There is also an episode from Bon Appetit’s podcast, and many others. Upon opening in April, the hotel had a soft launch to roll out the podcast programming over the past few weeks. Already, the team is seeing opportunities to take this new amenity even further.